When it comes down to it, not all fat is created equal! Sometimes breasts can be the bane of a woman’s existence. Many women (in fact, the vast majority by many major studies) experience discomfort or pain in their breasts from PMS and other hormonal-related ailments (e.g., menopause, fibroid cysts). And, for those choosing to live an active lifestyle, it is often at the expense of breast size (particularly for women losing weight!). But what if there was a product that could both alleviate pain and increase firmness/fullness— one that didn’t require you to choose between your breasts and a better overall body fat level? For women, the adipose tissue within the breasts plays a particularly vital role within the overall endocrine system— providing a local source of estrogen, with levels fluctuating during the monthly cycle and during menopause. Advanced Breast Therapy (ABT), from Lavoisier Health, was created to nourish this tissue in order to enable more optimal functioning. ABT is a topical application consisting of unsaturated fatty acids that penetrates epithelial barriers and stimulates changes in fatty acid metabolism in subcutaneous adipose tissue. This results in a number of benefits for breasts— including relief of tenderness, pain, lumpiness and/or dull heaviness, and hormonal-related breast discomfort (menstrual, menopause-related). It works by delivering key fatty acids along with agents to assist in absorption locally to subcutaneous tissue, allowing for more efficient nourishment and conversion into critical metabolites. The initial in-house study focused had two arms: one for the study of swelling and pain, and the other for treatment of fibroid cysts. For the first arm, there were eight participants with swelling and 16 with swelling pain (all linked to menstrual cycle changes or related to the presence of fibroid cysts). • 100 percent of the patients with menstrual-related breast tenderness claimed a 100 percent improvement (self-assessed scoring for pain severity). • 54 percent of those with menstrual-related pain and fibroid cysts or just fibroid cyst pain had 100 percent improvement, 42 percent had 75 percent or better improvement, and the remaining 8 percent had at least 50 percent improvement. • For the fibroid cyst arm of the study, 13 participants with a diagnosis of fibroid cysts and 13 participants with cysts of unidentified origin were recruited. The cyst count was identified by palpation and/or mammography. • 61 percent of all participants suffering from multiple cysts of unknown origin showed at least a 75 percent reduction in the number of cysts and 23 percent of participants showed a 100 percent improvement (no evidence of cysts). • 76 percent of participants with multiple cysts had a 50 percent reduction in cysts. • 66 percent of participants with a single fibroid showed 100 percent improvement and the rest showed at least a 75 percent reduction in cyst size. Besides the remarkable results for relief from these conditions, some of the women reported increases in firmness, volume and bra size! Accordingly, the team recruited 22 participants for a four-week study. 100 percent reported increases in firmness and 100 percent reported increases in size. None of them reported any adverse effects! LHS offers ABT with a Money-Back Guarantee of 90 days, so trying it is essentially risk-free. ABT is a truly exciting product! 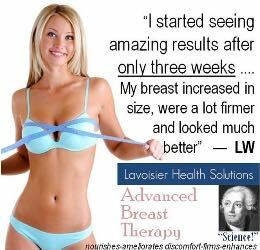 For more information and to order Advanced Breast Therapy, visit www.LavoisierHealth.com.